I'm as much a fan of a tempting glass of vino as the next person but incorporating it into my beauty regime? 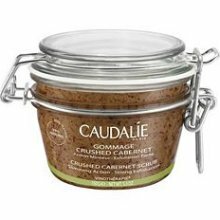 It's actually nothing new as Caudalie, one's of France's best loved beauty brands and purveyors of all things Vinotherapie, have been encouraging us to utilise by-products of the wine making industry since 1995. One of their bestselling products is Crushed Cabernet Scrub which I've been looking forward to trying for quite some time. I really like how kilner jars look in the bathroom, however, (and I know I bang on about this) tubs simply aren't the most functional presentation method as far as I'm concerned. The scent is an unusual blend of citrus (it contains lemon and lemongrass essential oils) but also warming, almost medicinal oakiness which hints towards the Cabernet name. 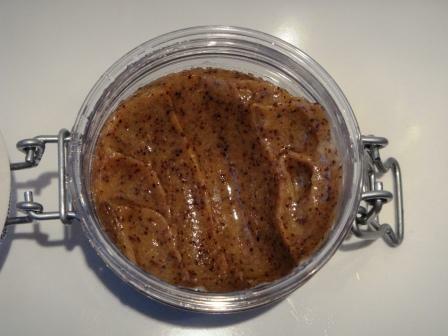 The course granules of crushed Cabernet grape seeds are definitely noticable and it's one of the most effective scrubs I've ever used, although I'm pleased to say that I didn't find it harshly abrasive. I'm so impressed to note that my skin wasn't just left smoothed, but wonderfully soft also, most likely due to the inclusion of honey in the formula. It's a slight bugbear that the product is described as having slimming effects as let's be honest, how much difference is exfoliating twice a week really going to make if you sit around eating burgers and chips all day? Even taken in context, when used alongside the recommended complementary products, it's a bit of a stretch to claim that this is going to have any more of a slimming effect than massaging in any other scrub on the market. My other complaint is that, like The Body Shop's Black Olive & Argan Oil Scrub, the granules don't dissolve and therefore, leave a mess in the shower. However, both of these are minor issues which certainly wouldn't put me off repurchasing. At £21.50 for 150g, it's pretty pricey but I do feel that it's worth every penny, particularly given that a little goes a long way. Overall, I absolutely love this and can't rate it highly enough.